You know, after careful consideration, I came to the conclusion that Valentines Day is not just a holiday for lovers. Oh no!!! Not by a long shot in my books anyways. Valentines day is a love fest. My belief is that Valentines Day is a holiday to show anyone and anything just how much they or it means to you. Now as many of you know, if you own a Jeep that is, your Jeep is like part of the family, often times even on a higher level then hot blooded members. 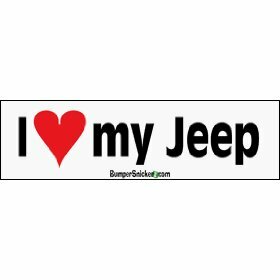 Now wouldn’t it go without saying then that when it comes to Valentines Day that your Jeep should place a significant spot on the Valentines gift list? I mean, really… doesn’t it give you a gift every time you get into it? Doesn’t it deserve that same love and consideration back? Well of course it does! So when you are sending your flowers to your significant other make a point to get something extra special for your Jeep love of your life. Here are some suggestions to get you started so no excuses… Don’t break your Jeep’s heart this year on Valentines Day. The Jeep TJ 4″ series II suspension lift kit gives more flexibility, more ground clearance, a quaility comfort ride, and the ability to run larger tires. Rough Country’s 4″ Series II Lift Kit has everything you need to enhance your Jeep’s performance on and off road. Includes Rough Country’s revolutionary rear coil spring design to counter-act passenger side coil fatigue. Front and rear coil springs, front and rear lower control arms, solid tubular transfer case drop kit, front and rear track bar drop brackets, sway bar links, and 4 RC Hydro 8000 series shocks. New XHD Replacement Soft-Tops from Rugged Ridge are now available and feature 50% THICKER Glass! Each Fabric Soft Top is specifically designed to easily fit the factory original soft top hardware. Simply take off the old top and slip on the new. Its just that easy! These new designs feature reinforced stitching on the heavy pull areas as well as heavy duty 30 mil thick glass! All XHD Soft Tops feature durable vinyl coated polyester and cotton fabric that will last the test of time. All sewn seams use marine grade thread to make sure it does not deteriorate or discolor in the sun. Each seam is literally welded shut with durable heat seal tape to keep moisture out while keeping the original look of the top intact. Attaching the Rugged Ridge Top is easy with the factory original belt rail attachment method; simply tuck under the rail and go! All our tops feature two choices of door options as Jeep offered the 97-06 Wrangler with upper soft doors or with full hard doors. Rugged Ridge makes a Replacement Top that fits either! Each top is backed by an industry leading 2 year limited warranty against manufacturer defects. This steering stabilizer allows for better on-road and off-road handling, as well as improves tie rod and ball joint wear and tear. This kit features our High Performance 2.2 series stabilizer cylinders and includes all brackets and hardware. Only fits JK with 2″ – 6″ of lift. Need a little extra coverage for those over-sized tires? The Rugged Ridge 7-inch Flare program gives you the extra coverage you need while providing the clean look of original equipment designs. Each oversized flare is constructed of virtually indestructible UV treated thermoplastic to provide years of service. The special UV treatment put on each flare provides protection from sun fading. These flares are designed to bolt onto your vehicle. If you go off-road and need to protect your vehicle from rock chips and debris, look to Rugged Ridge 7-inch oversized Fender Flares! Next Entry Jeep Thrills Wii ~ Are you Hooked? I feel the same way and I do get things for my Jeep all the time. I may buy something for it for Valentines Day but I won’t share that information with anyone else, especially my girl. She already thinks I love my Jeep more than I love her. She may be right, but I don’t want to be sleeping in my Jeep. I’ve grown accustomed to that warm body. You’re absolutely right and I’m going to do it. I’ve been wanting a couple of new enhancements and now seems as good a time as any to get them. Thanks for the push. Man, if I had a Jeep that looked that good I’d be getting it a Valentines gift for sure. Not that I don’t love my Jeep and keep it as clean as possible, but it’s 16 years old and the shine is definitely gone. Maybe a paint job would be the ideal Valentines gift for my Jeep! The women in my life play second fiddle to my Jeep and they know it. I have a Jeep fund that I contribute to every pay day and all of that money goes to adding accessories to my Jeep. If they don’t like it, they know how to find someone else. Women are heartbreakers, my Jeep doesn’t cause me problems at all! Right now, my Jeep is my girl. She treats me right, always shows me a good time and doesn’t tell me what a slob I am. As a matter of fact it’s all play where she’s concerned. Lizzy is my best girl and I’m OK with that, for a while anyway!